Listen Live Repeat is inspired Renk’s greatest and longest love affairs – her relationship with music and dance. From classical ballet training to exploring contemporary dance to the background beat of her favourite tracks keeping her company at work and play, Listen Live Repeat is a celebration of music experienced through the visual lens of a conceptual artist. 20 muses stand before you from different cultures, generations and experiences. They each chose a song or musical piece that was personally significant. Armed with each person’s song and a profile picture, Renk manipulated the images choreographing a dynamic dance of shape and colour in tune with each muse’s relationship to music. Sound waves translated to colour and shape illustrating the unique experiences music brings to each person. Upbeat tempos of colour work in harmony with precisely executed lines and shape. It’s the visual equivalent of a pas de deux, that moment in a ballet where two dancers sweep the audience into a whirl of emotion and energy skilfully hiding the mechanics of movement that create this effect and all in perfect time to a crescendo of music. Listen Live Repeat invites you to dance to the art, to interact with music in a new way and to use all our senses to experience the exhibit. We may live in the age of virtual media but our brains have always been able to transport us into the world of art, to smell the blue paint strokes of water, feel the shock of sharp angular points, to hear a roaring clash of colour. We can feel the emotions of the artist whether they are created as chords of music or inkjets on paper. If you are lucky enough to experience art with all the senses perhaps it’s time to turn the volume up. Renk created her conceptual art piece ListenLiveRepeat especially for Bodrum, a city steeped in music and showcased as part of a larger exhibition celebrating the talented Erbil family. 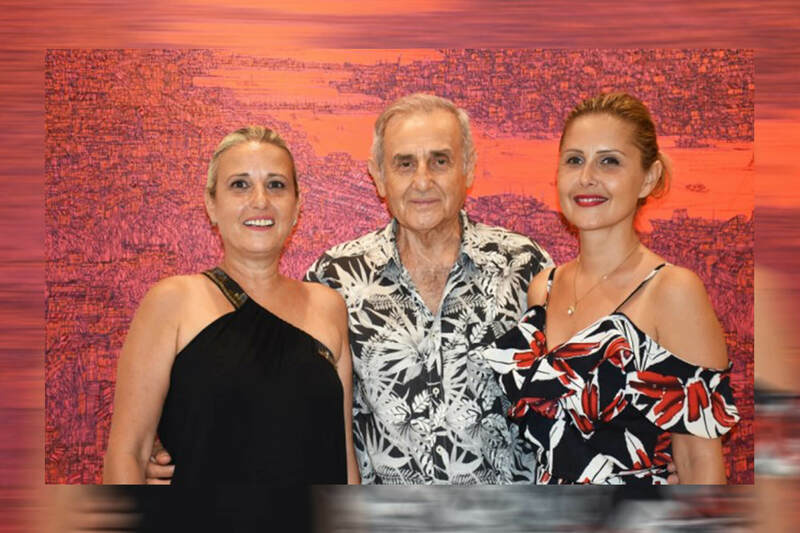 Featuring Devrim Erbil and his daughters Renk and Cigdem, the exhibit clearly shows that artistic talent resides deep in Erbil genes but each member of the family have taken their talent in different directions creating three distinct individual styles. ‘Three Erbils and Three Perspectives’ opened to great acclaim in Bodrum this summer. The exhibition is travelling across Turkey, next stop Gaziantep, East Turkey. Click here to visit our press page. Click here to shop Renk Erbil products.